Lieutenant-General Sir John Bagot Glubb, KCB, CMG, DSO, OBE, MC, KStJ, KPM (16 April 1897 – 17 March 1986), known as Glubb Pasha, was a British soldier, scholar and author, who led and trained Transjordan's Arab Legion between 1939 and 1956 as its commanding general. During the First World War, he served in France. Born in Preston, Lancashire, and educated at Cheltenham College, Glubb gained a commission in the Royal Engineers in 1915. On the Western Front of World War I he suffered a shattered jaw. In later years this would lead to his Arab nickname of Abu Hunaik, meaning "the one with the little jaw". He was then transferred to Iraq in 1920, which Britain had started governing under a League of Nations Mandate following war, and was posted to Ramadi in 1922 "to maintain a rickety floating bridge over the river [Euphrates], carried on boats made of reeds daubed with bitumen", as he later put it. He became an officer of the Arab Legion in 1930. The next year he formed the Desert Patrol – a force consisting exclusively of Bedouin – to curb the raiding problem that plagued the southern part of the country. Within a few years he had persuaded the Bedouin to abandon their habit of raiding neighbouring tribes. 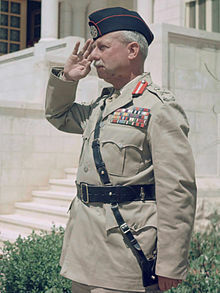 In 1939 Glubb succeeded Frederick G. Peake as the commander of the Arab Legion (subsequently known as the Jordan Royal Army). During this period, he transformed the Legion into the best-trained force in the Arab world. Glubb served his home country all through his years in the Middle East, making him immensely unpopular in the end. Arab nationalists believed that he had been the force behind pressure that made King Hussein I of Jordan join the Baghdad Pact. Glubb served different high positions in the Arab Legion, the army of Transjordan. 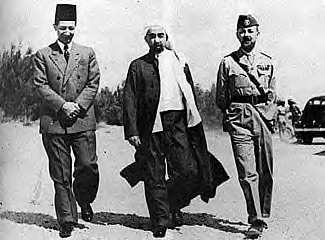 During World War II he led attacks on Arab leaders in Iraq, as well as the Vichy regime which was present in Lebanon and Syria. 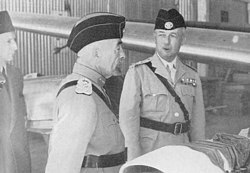 Glubb (right) with King Abdullah (left) the day before the King's assassination, 19 July 1951. Glubb remained in charge of the defence of the West Bank following the armistice in March 1949. He retained command of the Arab Legion until 1 March 1956, when King Hussein dismissed him and several other British senior officers in the Arab Legion. Hussein wanted to distance himself from the British and to disprove the contention of Arab nationalists that Glubb was the actual ruler of Jordan. Differences between Glubb and Hussein had been apparent since 1952, especially over defence arrangements, the promotion of Arab officers and the funding of the Legion. Despite his decommission, which was forced upon him by public opinion, Glubb remained a close friend of the king. He spent the remainder of his life writing books and articles, mostly on the Middle East and on his experiences with the Arabs. Glubb was appointed OBE in 1925; CMG in 1946; and KCB in 1956. In 1938, Glubb married Muriel Rosemary Forbes, the daughter of physician James Graham Forbes. The couple had a son, Godfrey (named after the Crusader King Godfrey of Bouillon) born in Jerusalem in 1939, and another son was born in May 1940 but lived only a few days. In 1944, they adopted Naomi, a Bedouin girl who was then three months old, and in 1948 they adopted two Palestinian refugee children called Atalla, renamed John, and Mary. Glubb's father was Major-General Sir Frederic Manley Glubb, of Lancashire, who had been chief engineer in the British Second Army during the First World War; his mother was Letitia Bagot from County Roscommon. He was a brother of the racing driver Gwenda Hawkes. Glubb died in 1986 at his home in Mayfield, East Sussex. King Hussein gave the eulogy at the service of thanksgiving for Glubb's life, held in Westminster Abbey on 17 April 1986. His widow died in 2006, whereupon his papers were deposited with the Middle East Centre Archive at St Antony's College, Oxford. Glubb's autobiographical story A Soldier with the Arabs was reviewed in The Atlantic Monthly, April 1958; The National Review, May 1958; The Saturday Review, February 1958; The Reporter, April 1958; The New Yorker, October 1958; and Foreign Affairs, April 1958. Writing in The Reporter, Ray Alan commented that the book was more than just an apologia; while it provided "no serious political analysis or social observation", it did offer interesting insights into the period, even if Glubb was out of touch with later trends in Middle Eastern politics. What Alan found more surprising was that Glubb also had hardly anything new to say about the 1948 Palestine war "in which he had star billing," instead lapsing into self-justifying propaganda. Alan ends his review with a long quotation from T. E. Lawrence, in which he reflects on what role a foreigner may play, and prays God that "men will not, for love of the glamour of strangeness, go out to prostitute themselves and their talents in serving another race", but will let them "take what action or reaction they please from [his] silent example". 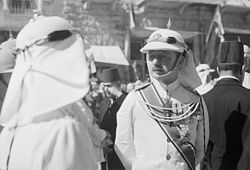 Writing in the Saturday Review, Carl Hermann Voss commented that Glubb served with and for the Arabs for 36 years, 17 of them for King Abdulla of Jordan. The portrait photograph is captioned "Glubb Pasha—'I ... failed hopelessly.'" Voss calls the book well written, absorbing, and often deeply moving; engrossing and informative, no matter how subjective; but also overly long. He enjoys the sensitive and lyrical writing that in places "could be scanned as poetry", feeling the "sudden fury of a border raid". In his 1993 poetry collection, Out of Danger, James Fenton mentions Glubb Pasha in "Here Come the Drum Majorettes! ": "There's a Gleb on a steppe in a dacha. There's a Glob on a dig on the slack side. There's a Glubb in the sand (he's a pasha)." The source for the following bibliography is Contemporary Authors Online, Gale, 2005. Reproduced in Biography Resource Center. Farmington Hills, Mich.: Thomson Gale. 2005, except *. (With Henry Field) The Yezidis, Sulubba, and Other Tribes of Iraq and Adjacent Regions, G. Banta, 1943. The Story of the Arab Legion., Hodder & Stoughton, 1948, Da Capo Press, 1976. A Soldier with the Arabs., Hodder & Stoughton, 1957. Britain and the Arabs: A Study of Fifty Years, 1908 to 1958, Hodder & Stoughton, 1959. War in the Desert: An R.A.F. Frontier Campaign, Hodder & Stoughton, 1960, Norton, 1961. The Great Arab Conquests, Hodder & Stoughton, 1963, Prentice-Hall, 1964. The Empire of the Arabs, Hodder & Stoughton, 1963, Prentice-Hall, 1964. The Course of Empire: The Arabs and Their Successors, Hodder & Stoughton, 1965, Prentice-Hall, 1966. The Lost Centuries: From the Muslim Empires to the Renaissance of Europe, 1145–1453, Hodder & Stoughton, 1966, Prentice-Hall, 1967. Syria, Lebanon and Jordan, Walker & Co., 1967. The Middle East Crisis: A Personal Interpretation, Hodder & Stoughton, 1967. A Short History of the Arab Peoples, Stein & Day, 1969. The Life and Times of Muhammad, Stein & Day, 1970. Peace in the Holy Land: An Historical Analysis of the Palestine Problem., Hodder & Stoughton, 1971. Soldiers of Fortune: The Story of the Mamlukes, Stein & Day, 1973. The Way of Love: Lessons from a Long Life, Hodder & Stoughton, 1974. Haroon Al Rasheed and the Great Abbasids, Hodder & Stoughton, 1976. Into Battle: A Soldier's Diary of the Great War, Cassell, 1977. The Fate of Empires and Search for Survival (PDF)., Blackwood (Edinburgh), 1978. Arabian Adventures: Ten Years of Joyful Service, Cassell (London), 1978. The Changing Scenes of Life: An Autobiography, Quartet Books (London), 1983. ^ Glubb, Sir John Bagot (1983). The changing scenes of life: an autobiography. Quartet Books. pp. 58–59. ISBN 978-0-7043-2329-2. ^ Morris, Benny (2008). 1948: The First Arab-Israeli War. p. 207. ^ Simon C Smith (28 June 2013). Reassessing Suez 1956: New Perspectives on the Crisis and its Aftermath. Ashgate Publishing, Ltd. p. 113. ISBN 978-1-4094-8013-6. ^ "Lieutenant-General Sir John Bagot Glubb". The Saleroom. Retrieved 13 September 2017. ^ Royle, Trevor (1992). Glubb Pasha. Little, Brown &co/Abacus. pp. 497–498. ISBN 0-349-10344-5. ^ Fenton, James (1993). Out of Danger. Penguin. p. 65. ISBN 0-14-058719-5. "Archival material relating to John Bagot Glubb". UK National Archives.